In this space and time, we were enjoying the same experience. We were two people paying attention to this one thing. As I walked off the hillside, I wondered why her small smile had moved me more than the vast crescent smile of the sun shining around the moon. I think it was a feeling of connectedness—a sense of unity that transcends familiarity; a sense of belonging that can happen even amongst strangers who are sharing experiences in community. But our communal life is going extinct. And it is making us lonelier than ever. When I was growing up, everyone watched the same televisions shows at exactly the same time and then gathered around the same school lockers or office water coolers to analyze, or laugh about, what they had watched. Now, for the most part, we binge on a Netflix series at our own pace. We don’t see the same things anymore. When I was growing up, you sat for a meal with your friends and everyone had the same conversation—the topic might shift, but you shifted with it together. Now, half a dozen friends can sit at a table and simultaneously carry on two dozen different conversation, as they juggle text messages and Facebook Messenger and Snapchat streaks and the comments section of a YouTube video. We don’t talk about the same things anymore. When I was growing up, my dad would play music on the home stereo. Mostly he’d play good stuff, like U2’s Joshua Tree or Paul Simon’s Graceland. Sometimes, not so much. But either way, we’d all listen. Now, my kids can each find a device and a set of headphones and listen to their own music. We aren’t dancing to the same tune anymore. When I was growing up, the news was the news, so you watched the same news as everyone else. Now, an algorithm tailors your news to your ego—whatever riles you up and makes you more certain of your beliefs gets pushed into your feed. Everything else is deemed fake news. Your reality is someone else’s hoax, and vice versa. We don’t even consume the same information anymore. I suppose it’s possible I’m just waxing nostalgic, just idealizing the good ole days, just grousing like an old codger. But it’s also possible the old codgers have always had something important to say. The difference is, we used to have to listen to them; now we can just slip on our noise-cancelling headphones. Even wisdom has been individualized. There are a few exceptions, though. An eclipse, for example. For a few hours, everyone was staring upward at the same sun. In awe of the same universe. Smiling about the same wonder. Blizzards accomplish the same thing. They stop us from racing in our separate directions and everyone has to hoist the same kind of shovel for a while. Why do concerts remain so popular? Because there is something joyful about a crowd full of people staring in the same direction, at the same art. And when the lead singer quits singing and holds the mic out and the crowd all sings in unison, well, communal events don’t get much more transcendent than that. Tragedies do it, too. Hurricanes, for instance—everyone watching and fleeing the same flooded streets. Everyone reminded of our common frailty. And when tragedies pass, mourning is still one of the most reliable communal events. Pain endured in community becomes a peculiar gift, a hidden grace, bringing us together as one, which is where we all really want to be anyway. But our communal life is being eclipsed by our technology. And the dark pall it casts is called loneliness. Unfortunately, this kind of eclipse won’t pass on its own. The light of our togetherness is something we have to reclaim and protect. We’re going to have to put down our phones and pick up the thread of the same conversation. We’re going to have to take out our ear buds so that something more eternal can bud within us and between us. We’re going to have to quit wondering what we’re missing out on, so we can all wonder together at the same shared life, right there in front of us. We’re going to have to push the moon out of the way and wrap our arms around the light of community and belonging for which we are all so deeply longing. Or, maybe, it was just a smile on a hillside. Maybe, somehow, while I was listening to Graceland, I became an old codger. Will the darkness gather, or will we gather? Great article & Yes all so true ! Cat, this sure does resonate with me, and I mentioned it in the Facebook Live session today. If you come up with something ingenious enough to compete with the stimulus and instant gratification of their devices, let me know! Sorry I’ll miss you this morning – will catch up later. The buzz of connectivity or the shared breaths and pulse of community? The slide into instant gratification feels cheaper and cheaper. I think part of it is that we are forgetting how to be alone with ourselves. In my little journey: cutting off technology for the hour before bed forces me into a book. Two Dots, my favorite game, feels increasingly like static. Not all the time. But increasingly. How it feels tells me something about how I am in that moment. And the motorcycle thing is wonderful. Such a beautiful reflection, thank you for it. We are indeed forgetting how to be alone with ourselves. Good for you for engaging in the long, gradual work of remembering. Solitude used to be my lifeblood and I cut myself off through the law of unintended consequences. NB: living with a human means that solitude takes work. A lot of work. As it turns out. Who knew? So I’m really trying to find my way back to a version of myself that has a longer view and isn’t such a ball of anxiety. And make that a well traveled path so I can find my way easily and have more grounding in the still place and less habituation in the buzzy one. Back to your post. Technological loneliness. What to do about it? Maybe that’s what the post and the discussion were missing. We recognize this growing thing. Sometimes. (Now get off my lawn. 😉 ) We need reminders and new habits as a means of keeping/restoring balance. What are some examples? How can we institute them? What have people done that has worked? A challenge to try for a week? What are we struggling with? It’s often easier said than done. I assure you that while some times it’s easy to put the device down at the appointed hour (or not pick it up) and some times I simultaneously try for one last hit while wondering why the h*cough* I am still looking. And some times it takes a great act of willpower but I manage without going for that one last whatever. This reminds me of my husband and I questioning the size of houses. We found when we moved into a larger house there was less connectedness because we all went to our own spaces in our own worlds with our own gadgets. Sometimes we wished for our smaller, have-to-be-in-your-space house so we could be more connected. Absolutely, that’s a great analogy, Ginny! Same dynamics at work. My thought when I got your marketing mail this morning was : “I wonder if he’ll be doing a Facebook Live chat today? I might have some free time, and could try and attend” And then find a “Things are worse today because ‘the interwebz'” argument. There is a certain irony in the guy who uses such technology to his benefit is today posting a gentle remonstration. I think part of it is due to changes in status & responsibilities. Things were better when I was a kid in large part because I was a kid. I didn’t have to be responsible to/for others. As age and the inevitable change that brings sets in, I create stories; stories driven by my grief at my own mortality. So Nah. Not buying it. I think you’re being overly dramatic. I signed up with Discus just so I could reply to this. I am not hearing Kelly say that everything… everything… was better in the good old days. What I am hearing is that there was more consensus than there is now because we were all consuming the same (roughly) media, at least in the communities we nested in. For example, my parents were not into Harlem jazz, as lovely as that might be. Their Irish-Italian tastes ran to Andy Williams and Mantovani. But everyone we knew watched either ABC, CBS or NBC news. When I was a teen and compelled to go on long family drives on Sunday afternoon in the mountains with my parents, I had my cassette player and Neil Diamond tapes and ear phones. So yes, it was possible tune out in 1972. And yes, they were hawks and doves back them. And yes, people bowed to the neon gods they’d made even back then. But it wasn’t the norm, the everyday, the constant. I am old enough to be Kelly’s mom; I remember Kent state, the Mi Lai massacre, vets being spit on, the 1968 Dem convention, riots in Watts, assassinations. Those were horrid, horrible things and we would not care to repeat them. I maintain, however, that our sense of community and responsibility to one another, while manifested in epic proportions during tragedies, is largely missing unless we are very, very intentional about making it happen. And unless we take measures to disengage occasionally from the technology that threatens to run our lives. I, for one, do not know how the founders and attorneys for Yelp can sleep at night. Ask any restaurant owner how often they are held hostage for the price of the meal with the threat of a terrible review because people can do it. Our society today is one where people are entitled… and empowered to ruin a business for the price of a fiesta platter. People feel justified in sticking their nose up the tailpipe of the car in front of them to get someplace three seconds faster. And who ever thought we would see the day when historical reenactors would cancel an event for fear of triggering violence? I am not trying to be combative, but if anything, I would say that Kelly was being underly dramatic. I’ve been reading his posts almost since the beginning and truly believe it is his best. The picture is of a glass percolator. It makes coffee. It does not talk back to me or take pictures of me or read my emails or require Bluetooth, wireless, or any technology except the electric igniter of my gas stove. I can’t walk away from it or it would boil dry; I must be intentional and watch it so that I can turn it from high to low when it starts to perk. 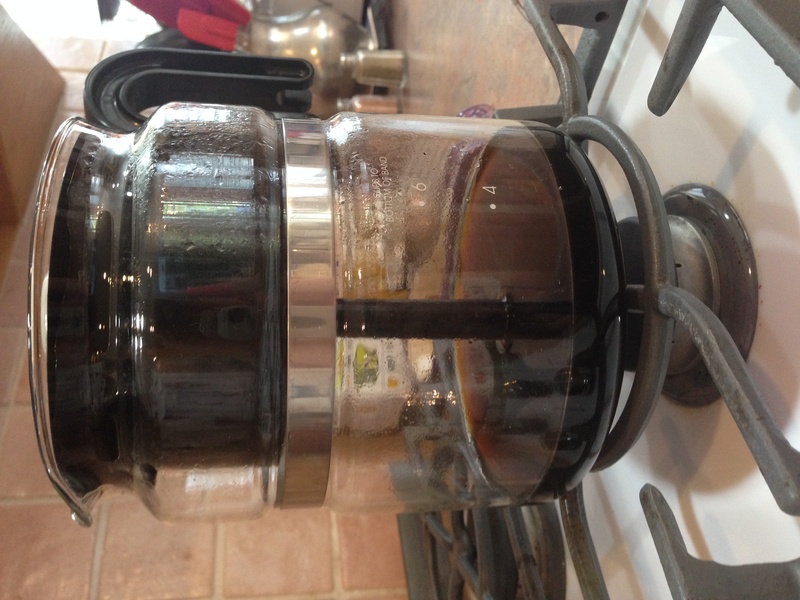 Making coffee becomes an exercise in mindfulness… As long as I put down the phone while it’s brewing. Too easy to slip into FOMO, IMHO. Oops. Thanks Michelle, for a thoughtful reply. I love your point about “…it wasn’t the norm, the everyday, the constant.” and what I’m suggesting is it isn’t the norm, the everyday, the constant now. Thing is my actual real world experience is this: I have good friends in a loving community, My family is healthy and happy and have all their needs (and some of their wants) met. I’m less likely to experience a violet death than at any point in human history. I can go on but you get the idea. Just take a walk around outside for 30 minutes and breathe deep. How is what’s on TV (or the internet) more real than that? For me, the answer is the experience I get walking my dog in the neighborhood is the reality. TV & Internet? Not so much. The Internet or TV is really trying to get my attention. They will use any method they can to get my attention, including telling me it is different today. Thanks, Mike, for YOUR cogent and kind response. Interestingly, today our son posted on Facebook that he was going to take the app off his phone and see what happens — more time for creativity? Mindfulness? (He’s the one who turned me on to “Untangled” years ago when it came across HIS feed.) I immediately did the same and then guess what? We actually (living in 2 states) talked on the phone! It was marvelous and such a sweet time. Car safety — Great analogy, Kelly! We can go even further and mention that traffic deaths have started to climb again after a long decline, blamed on distracted driving most notably from hand-held devices! Then there’s Colorado, where fatalities are being blamed on driving while under the influence of the green herb, which according to the Denver Post, people feel is not an impairment behind the wheel. But that’s a conversation for a different thread. anxiety levels, and my overall outlook. I’ll bet it has, Mike! I had to unhook from a lot of people I care about because their posts were angry, vituperative, name-calling screeds – on both ends of the political spectrum! Good on you for your decision and glad it’s been so beneficial! On the other hand, I did get to see a post of my 18-month-old grandson, 5 states away, stomping gleefully in a puddle, discovering his reflection, poking himself experimentally, and clomping around like Paul Bunyan. In his brand-new shoes, which will dry, but which his wise mommy decided were less important, overall, than exploration and the joy of discovery. Talk about technology’s mixed blessings! Man, this is so good…and so sad. I’m an “old codger” like you…probably a bit older, because I’m more likely to have been the dad listening to Joshua Tree than the kids. LOL! One of the other effects I’ve observed about this age of constant connectedness is that when you intentionally put the phone down and actually engage with real humans, as soon as there is a lull in the conversation, there is an immediate urge to pull out your phone and disengage from the moment. We’re no longer comfortable with silence, or a lack of stimuli, and when it all goes silent, we run to our security blanket. It seems that the more connected we become, the less comfortable with real connection we are. It’s terribly sad. Great observation. I’m going to post a YouTube video (ironically) in these comments that expands upon what you’re saying here. Thank you! Hi Kelly, I was thinking about this topic of being caught off from the community, after reading a blogspost from an American lady living in a tiny village in Spain. And I listened some interesting thoughts about this too on an audio collection I am listening these days, so the topic is fresh in my mind. Human “physical connection” may be diminished these days because of binging on nothingness in the electronic gadgets, but I do not think that that is the only reality. For instance, all of us gather here in your blog, and comment, and you respond, and I read Mike’s comments too because I find him interesting and caring, and I could continue. Emails or messages also arrive to me from other countries almost daily, sometimes after something I post on Facebook and my friends are reaching out (and I do the same). Also, because I can tailor what I read in my feed, or what I can watch on Netflix, I have my place of belonging… sometimes when I visit my 83 years old aunt in her apartment, where she usually has the TV set on the news, and I listen to her worrying about me traveling because of all the people that was killed in x, y and z place, I realize that she lives in a different world than the one I live… because I choose to focus on the bright side, that is fed by the news I choose to read. This is a lovely reflection, Cris. And I couldn’t agree with you more. Much of our Facebook Live (again, ironically) talked about harnessing technology to deepen connection, whether that’s by abstaining from it, or enhancing elements of it that increase true depth and intimacy. Our Courtyard Conversations come to mind. May we be wise in discerning which is which! Big internet hugs back at you! I’m 52 and feel the same – that our sense of community is slipping away, and it makes me sad. People don’t connect the same way anymore. It’s become not a group, of “us” – like in Friends or Cheers or those shows where folks just hung out together – it’s more “me, me” and everyone is separate. I find it very sad and depressing. The younger generation – those born at the boon of the cell phone era and beyond, don’t have the same skills for socializing in PERSON. They have no idea how to hold “real” conversations for the most part (I’m generalizing, but the majority rules) Less and less connection. Less community and sharing that is personal and in person. It’s all quick pictures and snippet online. It saddens me. I don’t see an answer other than if the internet “crashed.” As long as there is technology and internet, people will take that lazy way out. There is so much good to it, but so much not so good. I don’t see us able to reverse it to a time where people actually hang out and put phones down and talk together more. I see it becoming more and more that people have “remote” relationships via text or chat and less face-to-face. It has also caused the younger generation to get easily disinterested in “real”conversation. They would rather be online flipping to this or that and watching videos rather than looking someone in the eyes and speaking. It would be great – imagine if one day each week all people could do is TALK on the phone and not text or have internet. Imagine social sites down for a day. Wow. I think most would flip out. Thank you for your insight. I wish I had an answer! I have been mulling the idea of community for a few years…You speak the truth. I’m wanting to overcome my isolation due to depression and build community support where I live. I learned a lot by biennial trained as a peer counselor. I want to build a supported community for young people who want to persue a professional career in the arts. Reading this reminds me of theses truths, it takes a village and I believe to combat the isolation we live as a village. Through watching the documentary “Alive Inside” I saw how one person can initiate this kind of change. I recommend watching it to everyone I know and meet. In it music is used to reconnect residents in nursing homes with dementia. I personnel have had tremendous unwavering support from family and friends to become a drama, dance, integrstedvl arts teacher. Even though I’m not currently able to teach, I am still part of the support to my children, both actresses, dancers and singers. Performing arts is a tool for bringing people and communities together. I believe that pop culture, music and film must change to reflect this value!! Perhaps we are among the few still out there that enjoy the family movie night, or cheering on our favorite football team. I am blessed that when the kids come home from college that gathering around to watch a Star Wars marathon or one of the 80’s movies they only heard about. I think it is this connection that warms all our hearts.